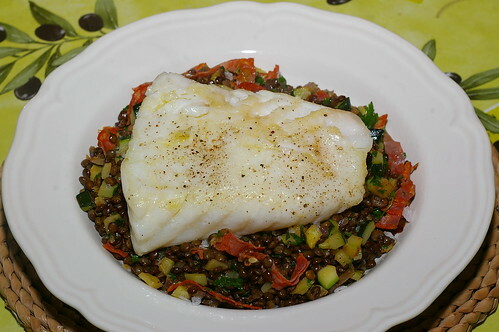 Cod loin with Puy lentils and chorizo, a photo by La belle dame sans souci on Flickr. 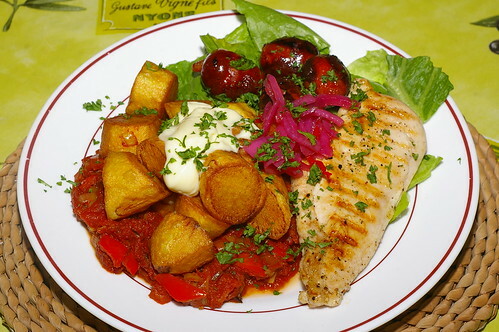 Patatas bravas with grilled chicken and mini chorizos, a photo by La belle dame sans souci on Flickr. A bit of a tapas-influenced meal last night. 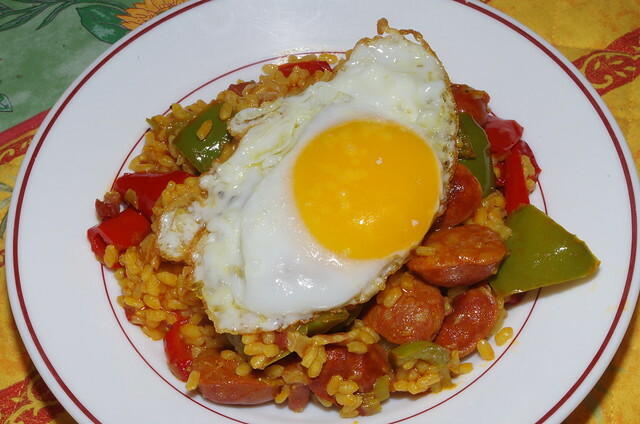 The mini chorizos are worth buying. They can be either baked in the oven or fried in olive oil and are really rather nice. These were fried in olive oil. 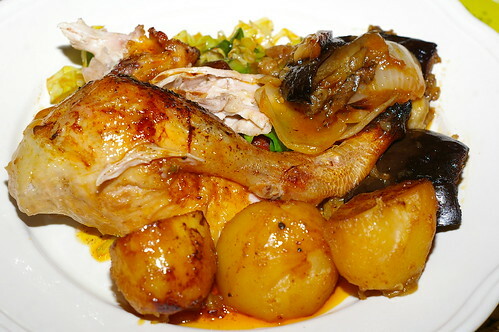 The chicken was simply a breast, sliced into two thinner fillets, seasoned with salt, pepper and olive oil and griddled until cooked but still juicy. The patatas bravas were peeled Charlotte potatoes, deep-fried and served on top of a thick and spicy tomato, leek, garlic and red pepper salsa, flavoured with smoked pimenton and some red chilli and finished off with a splash of sherry vinegar. The potatoes were finished off with a dollop of garlic mayonnaise and some of the pickled pink oinions I made last week. Some lettuce and a sprinkling of chopped parsley and there was dinner. 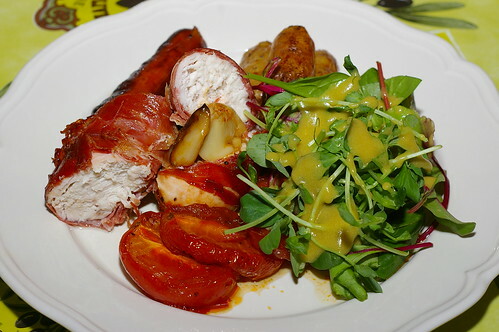 The meats were there for flavour and interest, but for me the real stars were the potatoes. 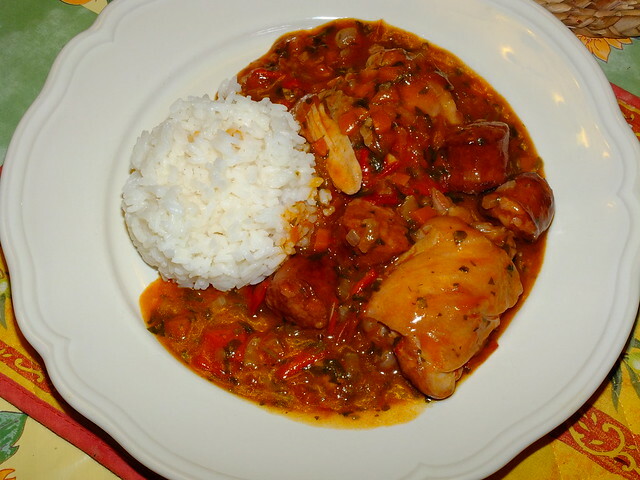 You really need a full-bodied Spanish red wine to go with this, or maybe some nicely-chilled Spanish lager. 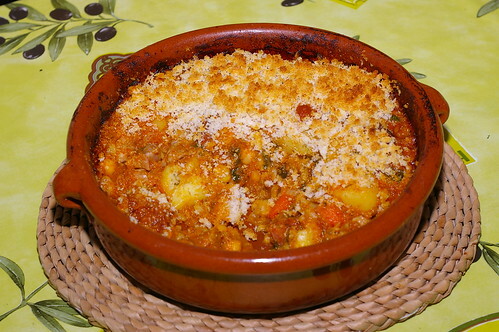 Pork with chickpeas and chorizo, a photo by La belle dame sans souci on Flickr.